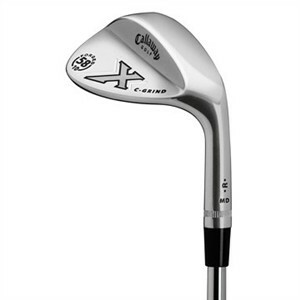 This Callaway X is forged with 1025 carbon steel to give it that sweet feel that you better players really appreciate. The radius from the heel to toe has been tightened to give this weapon more versatility. It has Callaway's unique C-grind sole. The coolest thing about this player's wedge is the beveled sole. This allows me to easily play many different shots with a closed or open face. Spend a little time on the practice green with this sweet piece of equipment, and you will become a short game wizard. Not only does it give me confidence to hit those super lob shots, but those 80-yard pitch shots dance on the green like Julianne Huff. The only thing I would complain about with this, besides the stupid looking "X," is the chrome finish. I prefer the darker colors. Not only do they just look really cool, they also reduce the glare from the sun. For a couple beautiful wedges with the darker colors, check out the Men's Titleist Vokey Spin Milled Oil Can Wedge and Cleveland's CG15 Black Pearl Wedge.